This is true and accurate copy of the Light Horse breast plate suitable for 1890, 1902 and 1912 pattern saddles. Made from finest quality English Sedgwick bridle hide with solid brass fittings copies of original period pieces. 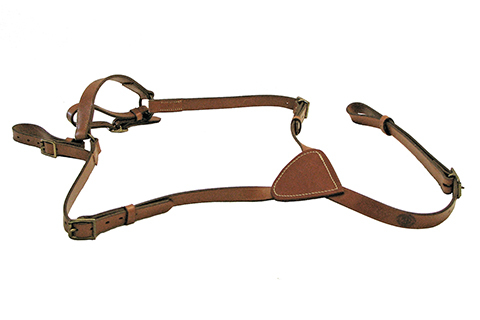 Breast plates are not required for normal use, but add to the overall appearance of the complete rig. They are supplied without any badge, but we are happy to fit yours if provided. Please Note:This item is made to order and usually takes 4-6 weeks to supply.